Welcome to a hidden gem in the heart of Old Naples. Bellasera Hotel, located at the gateway to 5th Avenue South, is where Naples’ tropical elegance, charm, and historical beauty are at their finest. Drawing its spirit and inspiration from the beautiful villages of Tuscany, our Olde Naples hotel offers you a richly appointed setting that glows with distinction. With charming courtyard fountains, Italian architecture, and Mediterranean cuisine, you are treated to “la dolce vita” – the sweet life – while enjoying all that our lovely Naples Florida hotel suites have to offer. So, we actually traveled further than we thought…we were in Tuscany! We changed into our bathing suits, and took the hotel shuttle to the beach. We sat under the shade of a Tiki hut, floated in the ocean for at least an hour, and enjoyed a tasty bloody mary. The water was PERFECT. A very pretty blue/green, and just the right temperature, to a Floridian that means about 75-80 degrees. Okay, I’ll admit it wasn’t quite perfect, an obnoxious little fish decided to tickle my leg! John, living with his girlfriend Leigh, loves his job, recently had a puck hit his eye during a pick up hockey game. Had 20 stitches, worried his Dad quite a bit, but is doing okay now. His girlfriend Leigh is going to school for nursing. They have 2(?) cute little dogs. Tricia stopped working in December to be a full-time mom to Kylie. Man, Tricia and Kylie took a trip to California, they love it there, but are staying in MA to be near family. Jack says Tricia and Kylie are busy,busy, busy! Jack’s sister ,Rita,and her husband Mike are living with Jack. They are thinking about buying a town house on Cape Cod. We went to Handsome Harry’s for dinner. I now have dining out down to a routine. I asked our server to check with the chef for menu selections. I had a delicious swordfish steak with polenta. We enjoyed a delicious brunch, I had green(asparagus) eggs and green (fried) tomatoes before Jack and Mary left for the airport and the cold northeast. 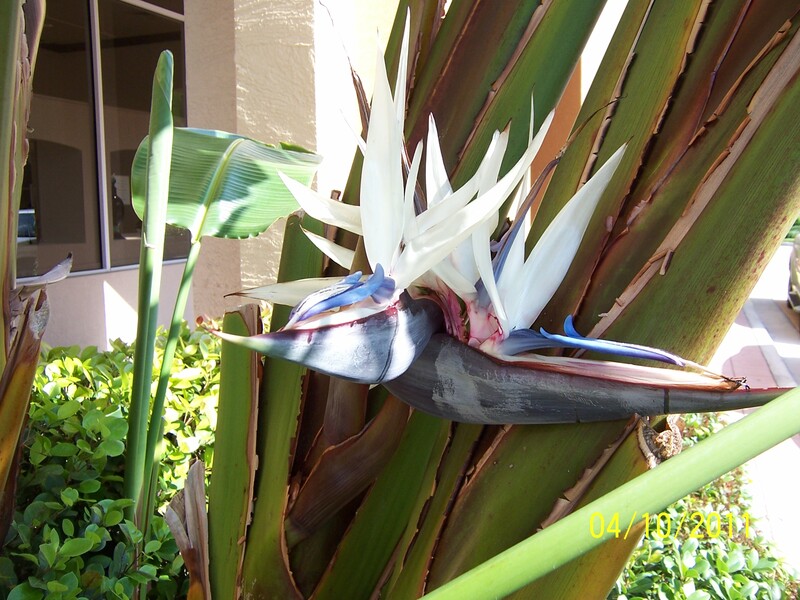 The flowers are a bit ahead of ours here in Tampa, I hope to have the feather topic out of my system soon…this is a white bird of paradise.